We go back to Nov. 14 when the Red Sox outbid the Mets, Yankees, and Rangers for the right to negotiate with Daisuke Matsuzaka. Thirty-two regular-season and two postseason starts later, John W. Henry gets to see why he opened his wallet for the Japanese righthander. Game 7 of the American League Championship Series is tonight and Dice-K gets a chance to redeem himself after two lackluster postseason starts. It's the biggest moment in this young man's career. He will have 37,000-plus fans hanging on his every pitch, cheering every out. Dice-K's been on the mound in big situations before, including a three-game span in the Summer Koshien high school tournament in which he won a 254-pitch, 17-inning game, came on in relief in the second, and fired a no-hitter in the third. Just two years ago he was on the mound for the deciding game when Japan beat Cuba, 10-6, to win the World Baseball Classic. "I can't make a simple comparison to those other games," Matsuzaka last night on his way out the door after Boston dispatched Cleveland, 12-2, in Game 6. "But I just hope that I can pitch the same way as I did in those other opportunities." Matsuzaka is an honorable young man who has been beside himself for his poor performance in the playoffs so far. That was reflected in his actions after he'd lost Game 3 of the ALCS last week at Jacobs Field. He sat despondent at his locker for more than an hour. He stopped staring only twice - once to eat, once to give a brief statement concerning his performance - before returning to his locker. Matsuzaka downplayed his mood last night saying, "Whether or not we had won or lost, immediately following the game is a very important time period for me, although I might have appeared very upset, I wasn't as upset as everybody thought." One of the most significant things Matsuzaka did this week was have a long conversation with Curt Schilling, last night's winner. "It's nothing very complicated," Matsuzaka said. "It's really very simple what we talked about. I just need to apply that in a simple way to my pitching." It remains to be seen if Schilling's words of wisdom can help Matsuzaka tonight. If Dice-K's recent performances are any indication, the Red Sox could be staring winter in the face. It's an awful lot to put on the pitcher, but it's what you have to put on him. The starters in this series have been hugely important. Fausto Carmona was terrible again last night and it cost the Indians a chance to wrap up the series. Dice-K can ill afford to do what Carmona has done. "We talked about pitching," said Schilling. "There are things that he has to get better at. For Dice-K to go from being a 15-game winner to a 25-game winner is no big thing. Details. Little details. Paying attention to little things. I was just trying to show him five or 10 things I do to keep consistent command of my fastball. That's the only thing holding him back. He has a great curveball, great change, great slider and when he adds fastball command at both sides of the plate, he's going to be unbeatable. "It's not gonna take one month or two months or three months," Schilling added. "He can do it tomorrow." He'll have to straighten it out tonight. For there is no tomorrow. "I have all the confidence in the world that if this goes to a Game 7 and Daisuke is on the mound, he'll win," said Schilling earlier this week. "He's got the makeup to persevere. The hard part for us is to make sure he understands that we're here for him and we'll do everything we can to help him be good. We're always open if he needs something because he doesn't have a large circle of people to talk to. It's a long season. It's lonely to travel a lot. We're having fun and we want him to be a part of it. For the most part he is and he works so hard to be good that you have to enjoy it sometime too and sit back and relax and have a good time." Josh Beckett has offered to back up Matsuzaka if he runs into early trouble. The Red Sox hope it doesn't come to that. Matsuzaka has had a rocky road this year. He was 15-12 with a 4.40 ERA over 204 1/3 innings in the regular season. He's had games where he's fallen apart and then regrouped. He's gone through winning streaks and winless streaks. He can be tough as nails for a few innings and then lose it in a blink. He was billed as a kid with six pitches with all kinds of movement. We heard about the gyroball, but nobody is really sure if they ever saw it. He would have to turn things around dramatically next season to be considered an elite pitcher. Matsuzaka's agent, Scott Boras, predicted there might be a late-season fade simply because of the rigors of the season. Now it's Game 7 of the ALCS and Dice-K will really have to reach back to help Boston to its second World Series in four years. In Japan, where he is considered a national treasure, they watch his every move. People are excited when he takes the mound. 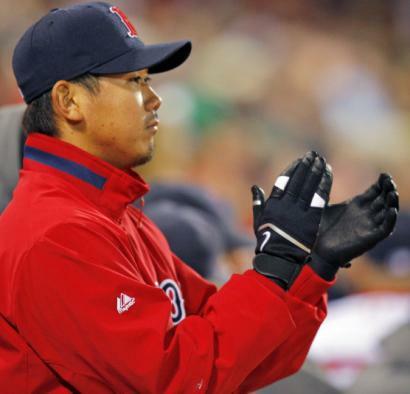 While there have been moments of disappointment, Japanese reporters believed this is the ultimate challenge for Matsuzaka, and sports fans in Japan - not to mention Red Sox nation - are anxious to see how he responds. Dice-K appeared very confident as he spoke softly but with conviction last night. "After the last few games, I believed I was going to have a chance to throw again. My teammates kept insisting I would have another chance," he said. "So I'm going into [Game 7] very excited." He had told the Japanese media Friday, "I want to pitch the Game 7. I deeply deserve that. I do not want to finish the season yet, especially as a loser. I want to [get] revenge to the Indians. In the professional baseball world, the result is what it's all about. Because I am a professional pitcher, I will not only do my best, but also to get the best result. After pitching Game 3 I felt our scouting report was correct. I am going to have to execute more pitches." And so Dice-K, the Fenway stage is yours.